Following Japan's lead, it appears Zero Collection is going budget in North America... at least at Amazon. 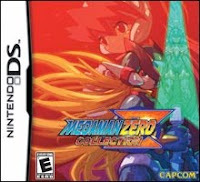 To compensate for the lack of Rockman Zero Collection: Best Price! on this side of the pond, residents of North America can snag and equally cheap copy of the game for $19.21 exclusively through Amazon. With only twenty two copies remaining, this deal can only last for so long. If you've yet to pick up Zero Collection, now might be the time to act! Click the above link to order. Thanks for the tip, Twitter!